FAYETTEVILLE, N.C. – Defenseman Travis Jeke came into this season with one goal in mind: focus on playing hockey in Fayetteville, rather than moving up. With a clear head, an increased role, and the confidence of his team, Jeke went out and played his career-best brand of hockey. His accomplishments and work-ethic did not go unnoticed. 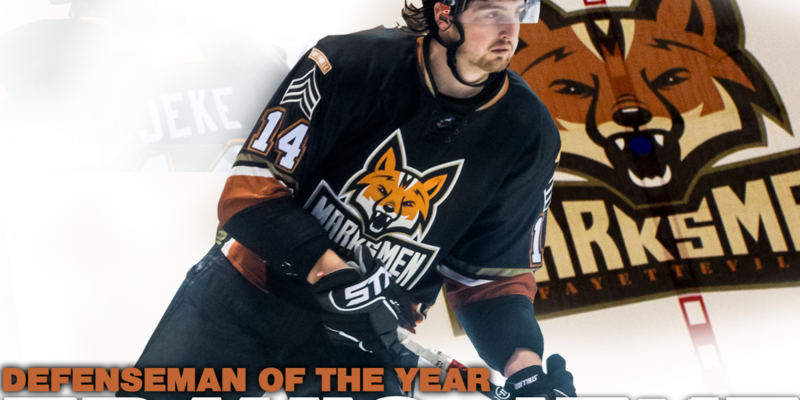 On Friday, Jeke was named an All-SPHL First Team defensemen, and today his accolade collection gains a shining-award: SPHL DEFENSEMEN OF THE YEAR. Jeke was one of just two Marksmen (Nolan Sheeran [R]) to play in ALL 56 games, and in that time, became the league’s highest-scoring defensemen with 38 Points (6G+32A). Halfway through the season – and for the first time in his entire hockey career – Jeke was named an Alternate Captain for his contributions to the Marksmen organization. During the course of the year, juxtaposed to his success, Jeke received more than a handful of call-up requests from teams in the ECHL; he turned down every one of them to keep true with his goal and stay with this team. Head Coach Jesse Kallechy praised Jeke for his dedication to the Marksmen this season. This is the third Defenseman of the Year award-winner in the history of the Fayetteville franchise (Mike Clarke, ’05-06/Andrew Smale, ’12-’13), and first individual-player award for the Fayetteville Marksmen. Congratulations to our very own Travis Jeke on his awards this season, and a hearty thank you for your dedication and contributions to the Fayetteville Marksmen organization!